In the real life story of the New Richmond tornado, the greatest tragedy was that buildings were not built the same way as they are today. Many people died because they took shelter, which would seem like the smartest thing to do. 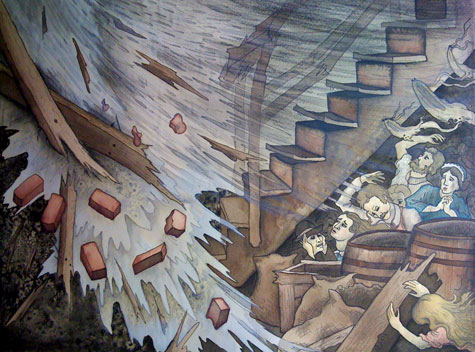 A larger group hid out in the basement of the town’s dry goods store, only to get pummeled by flying bricks and splintered timbers. I tried my best to portray what I imagine that would have been like. Nothing short of horrifying. The somber colors and diagonal elements are a departure from the other circus-themed works.